San Francisco, CA – September 12, 2017 – Bindlestiff Studio - located in the heart of SOMA Pilipinas - serves as the perfect venue for the world premiere of Conrad A. Panganiban’s Welga, a Filipino American coming-of-age story of a high school teen, Johnny Montalban, whose dreams of becoming a famous musician clash with his mother's dream of him first earning his diploma. Set in San Francisco's SOMA Neighborhood, the play explores family conflict against the backdrop of today's educational system, ongoing community pressures, and the legacy of Filipinos in the farm labor movement that sparked the 1965 Delano Grape Strike. Welga opens Oct 6th (FREE Community Preview Night, Oct 5th) and runs through Oct 21st; performances Thursday-Saturday, 8pm; Saturday matinee at 2pm on Oct 21st. 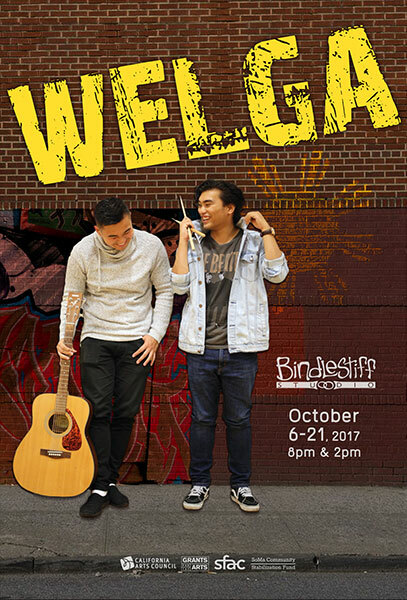 Welga comes at a critical time for the neighborhood with the recognition of the SOMA Pilipinas Cultural District by San Francisco’s Board of Supervisors in April 2016 and by the California Arts Council this past Summer. Bindlestiff is the primary arts venue and one of the anchor institutions of SOMA Pilipinas. Yet, while the neighborhood coalesces around the new moniker, SOMA is also the most aggressively developed district in the City, and the rapid changes bring both opportunity and crisis. For the award-winning playwright, Conrad A. Panganiban, the production brings his journey as a writer full-circle. Conrad first heeded the call to become a playwright when he participated in Bindlestiff’s Stories High Writing Workshop in 2003. Since then his plays, which specifically feature Filipina/o characters, have been produced throughout the United States and internationally. In 2015, he was commissioned by My Sister's House--a non-profit organization serving domestic violence survivors of the Asian American Community of Sacramento, CA--to write a play with music featuring the effects of domestic violence in a Filipino American Family. The play, ESPERANZA MEANS HOPE, has been performed at Sacramento City College, UC Davis, CSU, Sacramento, and SFSU. Conrad’s awards include: NEW AMERICAN ORDER – Official Selection for SF Playhouse’s Words Rising: A Celebration of Emerging Playwrights’ Monthly Reading Series. INAY’S WEDDING DRESS – Winner: 2014 James Milton Highsmith Drama Scholarship Award; THE BARBARY CAPER – First Place: Playwrights CageMatch Script Competition (Douglas Morrison Theatre); and PRINSESA (with Drew Stephens and Emmanuel Romero) – Audience Award for Best Screenplay (Scary Cow Film Festival). He is a member of Theatre Bay Area (TBA), Theatre Communications Group, and the Dramatists Guild of America. In 2017, he was a member of TBA’s ATLAS Program for Playwrights. Conrad has a BFA in Computer Art from the Academy Of Art University and an MFA in Creative Writing with an emphasis in Playwriting from San Francisco State University. The cast of Welga includes: Marissa L. Ampon, DC Fernandez, Lorenz Angelo Gonzales, Nicole Nutterfield, Aaron Orpilla, Ely Sonny Orquiza, Krystle Piamonte, Ava Tolentino, and Adisorn Wannaviroj. Thursdays - Saturdays @ 8pm. Oct 14 & 21, Saturday Matinee @ 2pm. Oct 5th, Pay-what-you-can Community Preview Show @ 8pm. Opening Night Reception, Oct 6th, catered by local vendors, immediately following performance. Sponsored in part by the SF Arts Commission, Grants for the Arts, Mayor’s Office of Housing and Community Development, and the California Arts Council. Originally opened in 1989, Bindlestiff Studio became the only metropolitan, community-based performing arts venue in the nation dedicated to showcasing Filipino American and Pilipino artists. Bindlestiff Studio provides the often under-served Filipino American community access to diverse offerings in theatrical productions, music and film festivals, workshops in directing, production, acting, stand-up comedy, and writing, as well as a children and youth theater programs. We are one of the proud anchor institutions of the SOMA Pilipinas Cultural District. Oct 5th, Free Community Preview @ 8pm.